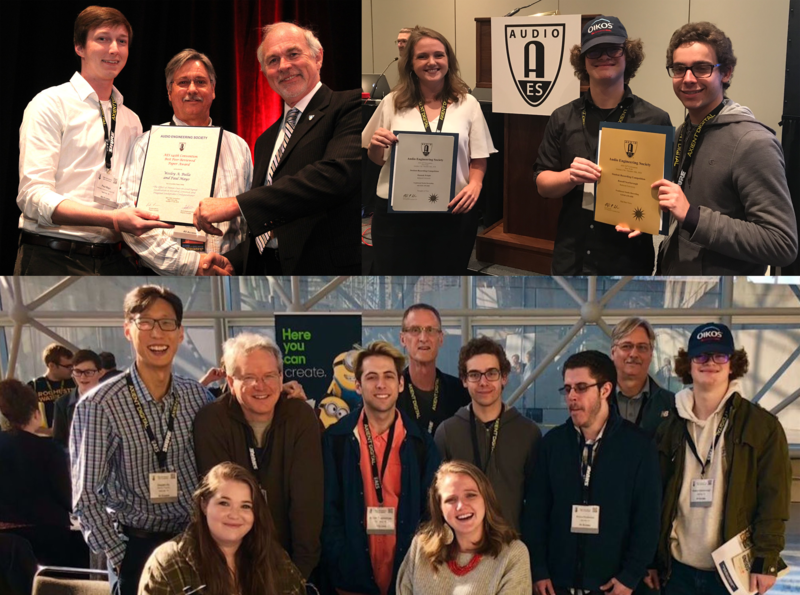 Belmont’s undergraduate and graduate audio engineering programs made a strong presence at the 2018 International Audio Engineering Society conference in New York by winning top honors in both research and music production. Professor of Audio Engineering Technology Wesley Bulla and recent MSAE graduate Paul Mayo were awarded “Best Peer-Reviewed Paper” for innovative research on how loudspeaker placement interacts with our sense of elevation. This year continues a five-year streak for the AET program with awards across multiple categories including Sound for Visual Media (2017 Silver and 2016 Bronze, Kerrick Crace), Modern Studio Recording & Electronic Music (2015 Silver, Nick Lobel), Traditional Studio Recording (2014 Gold, Cory Wilhite) and an Honorable Mention for Modern Studio Recording (2014, David Villa).